Safari is the web browser for iPhone and iPad by default. It includes your browsing history and bookmarks. Some of them are useful and convenient for you that if you lost them, it could cause some real inconveniences. There are many potential scenarios where you could lose Safari data. Such as accident deletion, upgrading iOS, system crash, factory reset, jailbreak and so on. What should we do in the event of Safari data loss? First of all, you should restart your iPhone and restart Safari to check if Safari bookmarks are back. If the bookmarks do not go back, you have to use the data recovery software to extract existing browsing history and bookmarks from your iPhone. H Data iPhone recovery software is a professional data recovery software for iOS devices and used on Windows computer. It can restore nearly all data on iPhone, covering Safari history, notes, calendar, contacts, photos, messages and other data on apps. It supports two recovery mode: scan and view from iTunes backup; scan from iPhone. You are also able to preview the data on the software recovery window and selectively restore the files you need. How to restore iPhone Safari from iPhone? Without iTunes or iCloud backup, you can only restore from your device. To achieve this, you need a computer or laptop, your iPhone and a USB cable, and the H Data iPhone recovery software. Follow these steps to restore your lost Safari data. 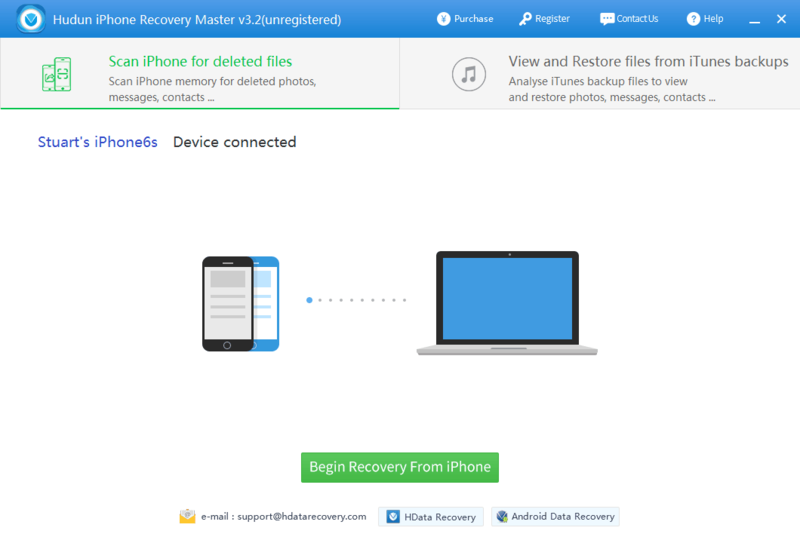 Free download H Data iPhone recovery software on your computer. Install and run it, and select the recovery mode to recover from iPhone. You need to use a USB cable to connect your iPhone to the computer. As it shows that your device is connected, you can start to recover data. Click the Begin Recovery From iPhone button to let it automatically scan your entire iPhone. As this process may take a little while, depending on the data size, you should make sure your laptop has enough power, and keep the devices well connected during the process, or it may lose connection and interrupt the scanning.After scan, you are able to preview all the contents recovered from your iPhone. Click Safari, you can preview the safari browsing histories on the right side. After the scan, you are able to preview all the contents recovered from your iPhone. Click Safari, you can preview the Safari browsing history on the right side. Tick the safari records and export them to your computer. If you have iCloud backup, the easiest way is to restore from iCloud. Sign in iCloud.com and go to Settings, you will find the option of Restore bookmark in Advance. Choose the bookmarks that you want to restore and click Restore button to restore them. But what you need to note is that your chosen bookmark will replace all the bookmarks on your iPhone.